Discussion in 'Introduce Yourself!' started by StoryDuck, Nov 26, 2018. I'm StoryDuck and I'm a father of a 7 year old boy who loves minecraft. We share this account and I help him out a lot with his Minecraft imagination. I'm also know for playing on my own when I get some free time to relax from work, class and being a dad. We are both very new to the server experience of minecraft but I must say it seems pretty fun. We are long time Minecraft players on PS4 but wanted to play with more people so here is our first online account. We have settled in an area of 9539, -7981 and have plans to make a fun fantasy theme area in the Mesa bio we found ourselves. We are pretty lost with the new computer setup we find ourselves using but I'm a quick learner and so is my boy. 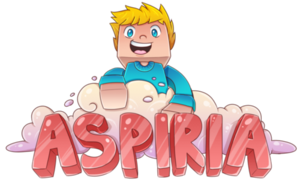 Not sure what is typical or expected of players here in Aspiria but you can count on us being super friendly and helpful. If we make a mistake let us know and by all means stop on by our work. Its bare bones at the moment but it should flair out quickly once I gather enough Acacia wood, light blue concrete, Birch wood, and sandstone of various types. is that a cow for me? Great, I'm hungry for a burger.